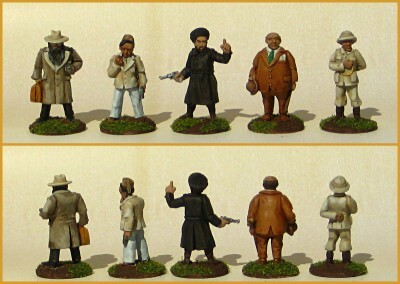 Second-to-last round of the 7th Lead Painters League over on the Lead Adventure Forum, and it’s more Pulp Figures for me, with a cadre of suspicious characters lurking in a back alley somewhere! Suspicious Characters! 28mm Pulp Figures. Click for full size, as always. These guys will be great fun in our Pulp Alley games, I’m sure. I’ll be doing up a League for them as soon as I’m back in Victoria and back into my usual gaming haunts! Off to the last round of the LPL today! It’s been a lot of fun to participate, even if real life has kind of cramped my painting schedule. Back to the Russian Civil War again this LPL round with some Copplestone 28mm Bolsheviks. I really like the whole Copplestone Back of Beyond range, even the “rank and file” infantry have loads of character and lots of really nice details. 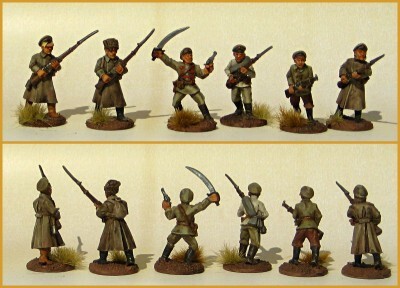 28mm Bolsheviks from Copplestone. Click for full size, as usual. The tan background and khaki on the Bolshies gives this photo quite a nice sepia tone overall; that wasn’t really planned but looks good! Round Seven of the LPL is up, and here’s my entry. 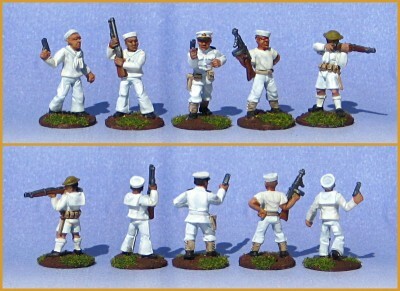 These guys are 28mm U.S. Navy gunboat sailors from Pulp Figures. I used the famous movie The Sand Pebbles as my source for the uniform colours, as I’m pretty sure Bob Murch did when he sculpted these figures. The all-white uniform is striking, but hard to do and keep interesting. I used a couple of shades of Reaper Master Series paint – they have a very nice triad of off-whites – and these sailors have come up very nicely. 28mm US Navy gunboat sailors from Pulp Figures. Click for full size, as usual. Over on LAF the LPL is continuing for another couple of weeks, go check out the current round! 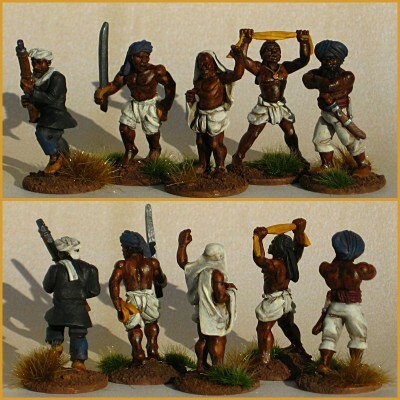 Last week’s LPL entry moves from the Lost Worlds of Round Three to the mysterious corners of the Indian subcontinent with some 28mm Thuggee cultists, also from Pulp Figures. The Dread Thuggee. Click to view larger. These murderous chaps come from three different Pulp Figures packs. The three right-hand figures – the leader, acolyte and sword-bearing bodyguard – are all from PBT-24 The Mad Guru. The swordsman is from PBT-21 Thuggee w/ separate assorted Weapons & Picks, and finally the rifleman is from PBT 23 Thuggee Fighters w/Martini Rifles. I’ve got another six or so figures to finish, as well as a couple of neat scenery bits that come in the Mad Guru pack. Most of the skin tone comes from W&N Burnt Umber acrylic artist’s ink, applied nearly full-strength over a basecoat of Reaper Intense Brown with a quick highlight (before the ink goes on) of Reaper Oiled Leather. The hair is mostly Reaper Walnut Brown, which is a very-nearly-black dark brown. Unfortunately for them, these skulking murderers ran straight into a really spectacular group of cavalry from one of the best painters in the contest, and got soundly thrashed, although lots of people said nice things about them! Luck of the draw; I’m a pretty solidly middle-of-the-road painter so a lot of how well I do in LPL sometimes comes down to who the random matchup for a given round is! Round Five of LPL7 is running over on Lead Adventure as you read this. Round Five is one of the Theme Bonus Point rounds, with this round’s theme being “Historical Civil Wars”. 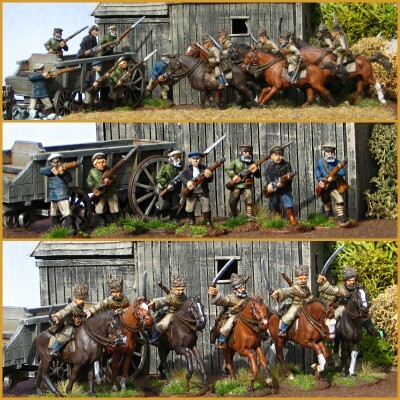 That’s right up my alley, so go see how my Russian Civil War figures are faring this week! More Pulp Figures goodness from last week’s LPL round. This crew of underdressed primitives was started sometime last year, finished over the winter, and have finally gotten their moment of glory, beating a very nice little regiment of 15mm Napoleonic figures in the third round of LPL7. The Shaman’s Crew, all from Pulp Figures. Click to view full-size. Round Four is going on as you read this, and can be viewed over on Lead Adventure. Alas, the Thuggee figures I’ve fielded in Round Four aren’t doing as well as the Neanderthals did. Perhaps they’re overdressed? Round Two of the ten-week Lead Painters League over on Lead Adventure Forum didn’t go so well for me, but at least the Blood Bowl dwarf team my reporters lost to was full of unique figures well painted! LPL7 Round Two – Reporters from Pulp Figures. Click for full size. The reporters are from Pulp Figures, of course. The 7th Lead Painters League contest continues for another eight weeks over on LAF. It’s a fantastic contest on a great forum; I compete to force myself to push my painting up a notch and get stuff painted and finished! My Round Three entry is in already and will go up over on LAF Sunday morning; Rounds Four and Six are done except for basework and photography; Round Five is going to take most of the time before it’s deadline to complete, as it’s a bonus round with a big crowd of figures to finish off! Beyond that I have enough figures in progress to cover Rounds Seven through Ten, although I’m still debating what to do for bonus points and a spectacular finish in Round Ten… wish me luck! So Round One of Lead Adventure Forum’s Lead Painters League 7 (LPL7) painting contest has wrapped up. The (non-mandatory) bonus theme for this opening round was “Headquarters”, so I touched up some of my Russian Civil War White Russian figures from Brigade Games. 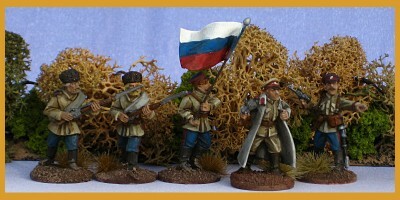 My LPL7 Round One entry — a Russian Civil War White Russian colour party. By the time this is posted the Whites will have won their round against a rather nice Second World War company HQ of French goumiers – North African colonial troops – and Round Two will have opened. You can check out the whole contest over on LAF. LPL7 is ten rounds long, so ten weeks. I’ve got Rounds One, Two & Three done and entered, but things are going to continue to be fairly quiet around here as I’m neck-deep in painting up Rounds Four through Ten! 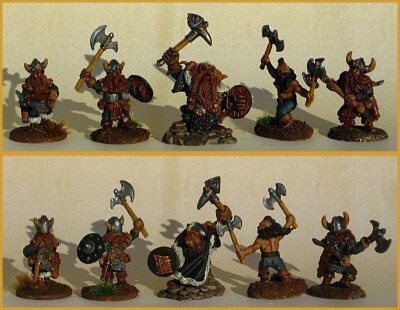 Over on my favourite wargaming forum ever, the Lead Adventure Forum (LAF), the approximately annual Lead Painters League painting contest has begun to accept participants. This is the 7th time LPL has been run, and it’s always great fun to spectate and vote, and even more fun (although also more work!) to enter the contest. I participated in LPL3 in 2009 and LPL5 in 2011, and have sent my entries in to participate in LPL7 now. It’s a fun, friendly competition, very much in keeping with the overall spirit of LAF. Participants submit photographs of teams of five (or more) figures; they’re randomly paired with one of the other participants, and may the best team win! The use of groups of five figures – all of whom have to appear in the main photograph together – makes LPL a balance between painting skill, photography skill and presentation skill. It’s a great chance to stretch my painting abilities and my photography skills, and clear unpainted or unfinished figures out of the lead mountain. I should be able to finish this year’s LPL, including all three bonus rounds, without buying any more figures. It helps that all three of the bonus rounds are close to areas of interest, and it’s nice to put a ten-week fifty figure dent in the unfinished figure pile! The rules are in this LAF thread, and as I write this there are only 18 entries in for 50 total slots, so get to it and enter!